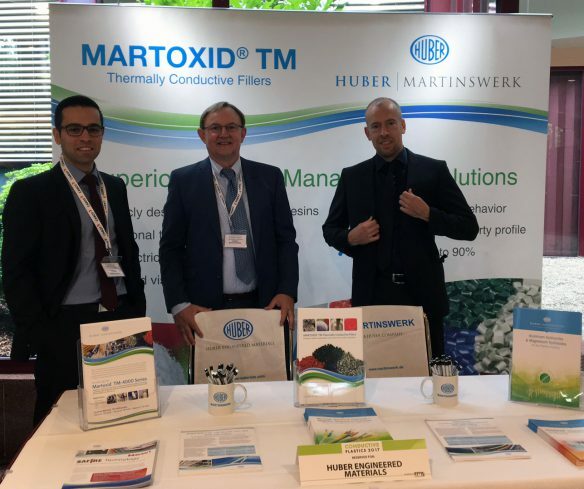 Huber | Martinswerk’s NEW Martoxid® TM Thermally Conductive Fillers were the focus of our exhibit at the Applied Market Information’s (AMI) Conductive Plastics Conference in Cologne, Germany. Answering attendee’s questions were (from left) Bashar Diar-Bakerly, Research & Development Scientist; Henning Hofius, Product Development Manager; and Martijn Mies, Research & Development Manager. 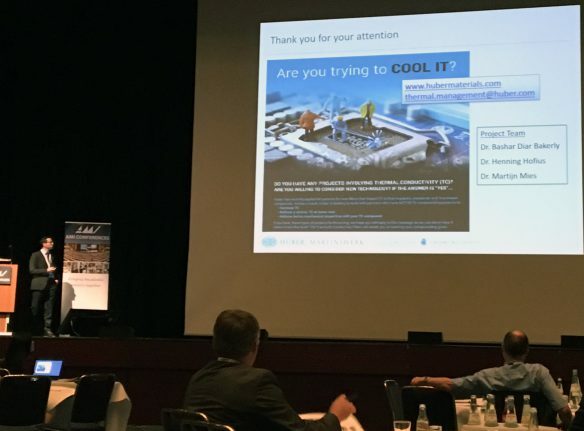 The Huber | Martinswerk team was quite busy this week in Cologne, Germany as we exhibited and also presented a special technical session on our exclusive and NEW Martoxid® TM Thermally Conductive Fillers at the Applied Market Information’s (AMI) Conductive Plastics Conference in Cologne, Germany. As electronic parts become smaller, there is a need for greater thermal conductivity for the surrounding thermoplastic and thermoset materials. Huber has introduced four series of white, Martoxid TM thermally conductive additives, which allow up to 3 W/(m.K) thermal conductivity while maintaining electrical insulative properties. In addition to showcasing the Martoxid TM portfolio, we also discussed our high performing halogen-free fire retardants and smoke suppressants for a variety of plastics and wire and cable applications. Attendees of AMI’s Conductive Plastics Conference listen intently as Bashar Diar-Bakerly (far left) presents technical information on the Huber | Martinswerk line-up of Martoxid® TM thermally conductive fillers. Are You Trying to COOL IT? Is Thermal Conductivity (TC) Important to You? If the Answer is Yes, Check This Out!